Migration and Refugee Services (MRS) helps those who have escaped persecution begin new lives with dignity. We provide refugees with comprehensive support to achieve successful resettlement and self-sufficiency in their new homes. Our case managers oversee all logistical elements of the resettlement process, refer clients to outside agencies, and troubleshoot any adjustment issues our families might encounter. Caseworkers work with community partners at the University of Louisville, Family Health Centers and Home of the Innocents to provide all incoming refugee clients and their families with an initial medical check-up and Green Card vaccinations. These screenings also give clients early access to necessary medications and appointments with specialists. Our mental health coordinator conducts regular screenings and makes referrals to outside agencies for mental health treatment. Caseworkers monitor refugees’ medical insurance eligibility and access and troubleshoot any issues that arise. English as a Second Language training and cultural orientation are essential components of integration into a new culture, employment and independence. We partner with Jefferson County Public Schools’ Adult and Continuing Education program to provide quality instructors for our classes. English classes are structured around real-life lessons and workplace skills knowledge. Students take assessment tests for placement in an appropriate class, where they learn greetings, grocery shopping terms, financial literacy, job vocabulary and how to conduct themselves in a job interview. They take field trips and learn critical thinking skills. Child Care is available for children up to age 5. Our teachers and volunteers provide a safe and welcoming environment that encourages learning and social development. We focus on language, motor skills development, art, music and movement. Parents and children meet during PACT (parents and children together) time when they engage in short meaningful activities that provide the families with an opportunity to learn together. Over 60 percent of refugees resettled by MRS are under the age of 18, which prompted the launch of our youth services department. Children who are not supported in the early months of resettlement are at risk of suffering from depression and loneliness, which makes this department crucial for families. Our staff work to provide case management and targeted programming to ensure children have the support they need to succeed in their new home. School Registration and Orientations – Once children arrive to Louisville, we enroll them in Jefferson County Public Schools through the ESL Intake Center. 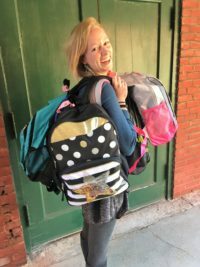 Prior to starting school, each newly arrived child receives a backpack full of school supplies, as well as school uniforms if needed. Children and parents are given orientations about what to expect, such as daily school schedules, grade and attendance guidelines, navigating JCPS, and language access. Parents also are assisted with navigating parent teacher conferences and other school meetings. Summer Program – Students who arrive during the summer are enrolled in our youth summer program, which takes place Monday-Friday from May through August. JCPS teachers and volunteers teach English, math, reading, and art and music therapy classes to school-aged students to familiarize students with school routines. In addition, students go on field trips to places like the Big Four Bridge and a carnival hosted by a local parish youth group. We typically average 40-80 students a day in this program, and it is a highlight of our youth services department. Referral Services – The youth services department makes referrals to outside agencies when necessary. 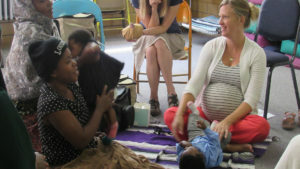 We have relationships with social service agencies such as Home of the Innocents and the Center for Women and Families. Businesses who hire refugees can sometimes qualify for the Work Opportunity Tax Credit. Refugees contribute to a more diverse workplace and have proven to be dedicated employees, improving productivity. Refugees have the documentation needed to satisfy I-9 requirements. Our employment team works closely with employable refugee clients from the time of arrival to give them the skills they need to be successful. Training includes English classes, orientations on workplace culture and expectations, supervisor/employee relations, interview skills, understanding new hire paperwork and more. Our refugee clients have obtained positions throughout various industries, such as warehouses, JCPS, hospitals, factories, hotels, restaurants and retail stores. We help facilitate every aspect of the hiring process, including pre-screening applicants to ensure job requirements are being met, assisting with applications and interviews, and providing interpretation and training. We also provide post-hire follow-up and support. These services are provided at no cost to the client or employer. Quality employment is the most important factor in achieving self-sufficiency, and we are proud to have strong relationships within the business community. Any local business or organization interested in partnering with our employment team can use this form to contact us, email MRSemployment@archlou.org or call 502-636-9263. The Support Services Team provides medical and mental health resources, long-term case management, and access to services and supportive programs that are not typically included in the core case management program. Much of this team’s time is spent on Health and Wellness Case Management. Clients in need of assistance in this area are given an orientation that focuses on the details of the Refugee Health Screening, how to use their Medicaid insurance and their rights as patients, such as the right to an interpreter and a basic understanding of their right to privacy as outlined in the Health Insurance Portability and Accountability Act (HIPAA). Refugees gather together and, with interpretation, learn about a common element of American life. Presentation topics include banking, transportation, energy saving, legal rights, gender relations, housing, and the role of police and firefighters. In addition to our staff members, many community guest speakers also present topics relevant to their field of work. Fridays: 9:30 am – 11:00 am. The Women’s Empowerment class is offered to new refugee women enrolled in our ESL program. Refugee women and children are especially vulnerable during the resettlement process as they face unique challenges. Many refugee women have faced unequal access to resources in their former countries, have experienced violence and neglect, and/or also have come from backgrounds where the voices of women may not be valued. The Women’s Empowerment class focuses on educating and empowering refugee women with the skills and confidence necessary to create a safe and healthy lifestyle for themselves and their families. The skills they learn are essential to improving the quality of their lives and their communities. Acculturation challenges, preventive health, budget and finances, home safety and childcare are some of the topics covered. In 2014, a dedicated volunteer, Suzanne Klemenz, helped create a sewing program for refugees to learn or improve their existing sewing skills, express their creativity, learn new vocabulary and have an opportunity to socialize in an informal setting. In addition, the students also have an opportunity to gain some practical experience that can empower them to be successful in employment. Items made by the clients are sold around town at Christmas bazaars, our Common Table lunches and at fundraisers. Mondays and Wednesdays: 10:30 am – 1:00 pm. Many refugees come to Louisville with basic to no computer literacy, which makes our computer classes vital to successful integration in our society. The ESL Computer program teaches employable refugees the computer skills they will need in everyday life with specific focus on skills related to obtaining and maintaining a job. Our teacher crafts lessons based on students’ ability ranging from basic hardware skills, such as learning how to use a keyboard and mouse, to using Microsoft Office programs for creating a resume or a simple budget. For our advanced students, the GED and College Readiness Computer Class is also offered to learn the skills they need to be successful on the GED test and in higher education. Monday – Wednesday: 9:00 am – 3:00 pm. Through a grant provided by the Office for Refugee Resettlement, MRS is able to provide special services to clients 60 and older. These clients are invited to participate in the citywide Elder Program where they can take advantage of English classes, citizenship preparation and case management targeted to their needs. Participants also benefit from outside contributors who offer opportunities such as yoga, community presentations and monthly field trips to local attractions. For a period of up to five years, the intensive case management case worker can help these clients access elderly-specific social programs such as supplemental income from the Social Security Administration, transportation and day programs. Tuesdays and Thursdays: 10:00 am – 12:00 pm. at Highland United Methodist Church, 1140 Cherokee Road.